~Jennifer~ | 12:53 PM | book review | Netgalley Please comment! The Truth About Alice is a quick read, and I was able to read it in one night. It was well written but also painful because I could see the direction the story was headed, and it wasn't going to be a good place. My heart went out to Alice right away. Told from the POV of four different (yet stereotyped)characters, The Truth About Alice is a brutal and realistic look into how horrible teens can be to one another. The way Alice was bullied was heartbreaking, and by the way, she received no solace at home because her life there wasn't much better with a mom who's checked out mentally and physically. I fully expected to hate the popular girl who threw the party, Elaine, the most, but I ended up hating Kelsie, Alice's ex-BFF, more. I felt the rumor Kelsie began spreading about Alice was way over the top, and while she did it out of sheer desperation, I still wanted to wring her neck. I mean, wow. That was messed up. The friendship that blossomed between Kurt, stereotyped as a social misfit, and Alice was a breath of fresh air. I think Kurt was my favorite character because he was there for Alice when no one else was. I knew what he was thinking and that his motives were pure since I got his POV. Josh, the survivor of the car wreck, was just kind of blah for me. I thought the secret he was hiding was interesting, and I caught on to it right away; however, he didn't have much of his own personality. My mind is blown by how simultaneously amazing and scary one lie can snowball into so many and ruin so many people's lives in the process. Just when the rumors seemed like they couldn't get any worse, they did. I couldn't put The Truth About Alice down. The deeper I became immersed in the story, the more information I was given which allowed me to start piecing together what really happened that night. There were some surprises along the way, and once I finished reading, I took some time to digest it all. I did take off a star for the characters being entrenched in stereotypes. 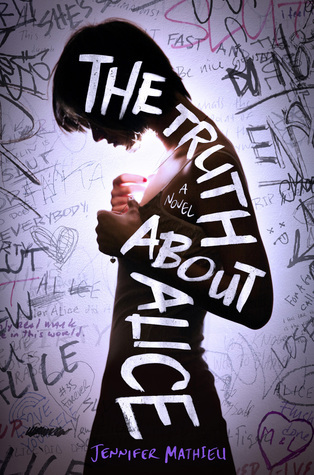 Otherwise, I do recommend The Truth About Alice, especially to teens who can likely (and unfortunately) relate to the bullying and rumor spreading that goes on in this book.